Endpoints must use the Endpoint Protection keycode before they can report into the Management Portal. If there are endpoints in your network that already have SecureAnywhere installed with a different type of keycode, for example, a Consumer version of SecureAnywhere, change the keycode either by issuing a Change Keycode command or by activating a new keycode directly from the endpoint. For more information, see Issuing commands to endpoints. When you enter a new keycode, SecureAnywhere launches a scan. If the system does not launch a scan automatically, go to the PC Security tab, then click Scan My Computer. When the scan completes, SecureAnywhere reports into the Management Portal. 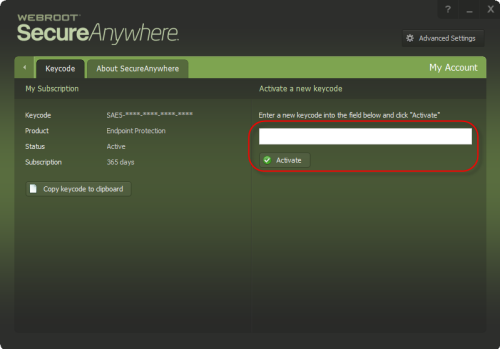 Open the SecureAnywhere interface. 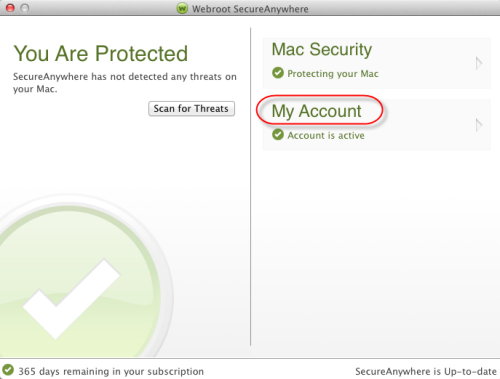 Click the Webroot icon in the menu bar, then select Open Webroot SecureAnywhere from the drop-down menu. 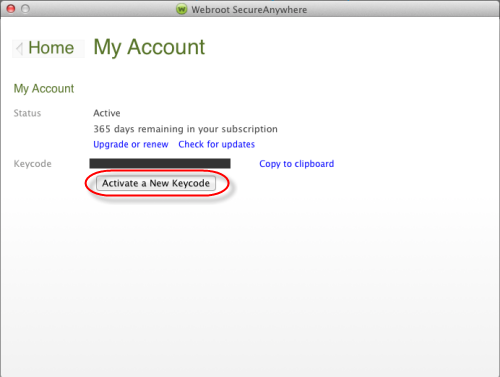 In the My Account window, click Activate a New Keycode. In the dialog, enter your Endpoint Protection keycode and click the Activate button. Once the new keycode has been activated, return to the Management Portal and look for the new endpoint in the Default group. If desired, you can reassign the endpoint to another group. For more information, see Moving endpoints to another group.